Add this chair to your living room. 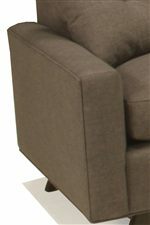 This piece features track arms, a tufted back, and a mid-century modern wood base with angled feet. For a complete set, pair this chair with the coordinating ottoman. This piece is available in multiple fabrics and leg finishes to choose from. The 1482 Mid-Century Modern Upholstered Chair with Tufted Back by McCreary Modern at AHFA in the area. Product availability may vary. Contact us for the most current availability on this product. For a cozy yet contemporary living room, add the 1482 collection. This group consists of a sofa, chair, and ottoman. 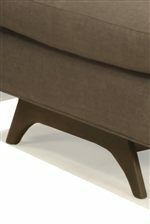 Mid-century modern features include track arms, tight backs with simple tufting, and wood bases with angled feet. With multiple fabrics and leg finishes to choose from, this collection is sure to fit perfectly in your home. The 1482 collection is a great option if you are looking for Mid-Century Modern furniture in the area.